If a Surface Pro is what you feel you need to keep your grades up for the next school year, or to move ahead in the workplace, the Microsoft Store has a bundle package that can save you $360. The deal features the fifth generation Surface Pro, which is powered by the Intel Core i5 processor. The device is equipped with a 128GB SSD and 8GB of RAM. Along with the tablet, the bundle includes the Platinum Signature Type Cover. Normally, purchasing those two items separately would cost you $1,159. With the deal, you are paying $799, which is a $360 or 31% savings. 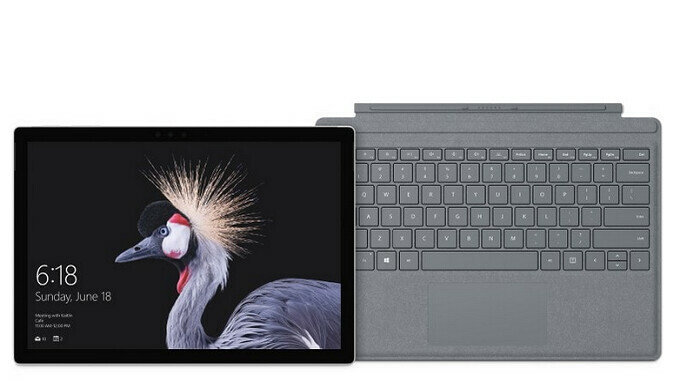 According to Microsoft, the fifth generation Surface Pro starts up and resumes faster than any previous model, and has 50% longer battery life than the Surface Pro 4. It also is equipped with redesigned front-facing speakers and a fan-less cooling system that runs quietly. If you like the versatility of the Surface Pro, which allows you to turn the tablet into a Windows 10 Pro powered laptop by adding the Type Cover, click on the sourcelink below. We don't know how long this deal will run for, so if you are interested, do not procrastinate. In addition, if it is easier, you can order the bundle online and pick it up at your local Microsoft Store. That's a great deal. Surface products are about the best laptops/2-in-1s/tablets that you can get, especially with productivity in mind. Any way to stack this with the student discount (10%)?